Although the Chinese were making porcelain over 2,000 years ago, due partially to having a rich supply of the clay known as kaolin, it was not until 1704 that the German physicist, Ehrenfried Walther von Tschirnhaus, finally cracked the secret of how it was done. For many years porcelain was a rarity and very much treasured. It wasn’t until 1771, when the book L’art de la Porcelaine was published, that the secret was well and truly out. Porcelain factories then sprang up all over Europe, the first being the famous Meissen factory in Germany, which is open to this day. 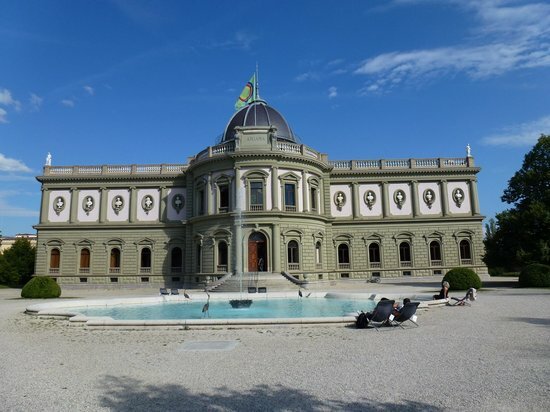 Over the years, museums devoted to displaying examples of fine porcelain have been established in many cities worldwide and one of the best is the Ariana in Geneva. As the only institution of its kind in Switzerland, Romandie West Region organized a visit for members on 26 March. On a clear but very blustery day, we gathered in the museum’s imposing entrance hall to start our tour equipped with audio guides which were conveniently available in English. Each person was thus able to view the magnificent exhibits at his or her own pace. In well – illuminated showcases, with clear numbering and letters to correspond with the recorded commentary, we were able to see examples of porcelain ranging from early Chinese to those of famous 18th and 19th potteries in France, Germany, Holland and Italy. Sadly, there were very few exhibits from Great Britain. Built at the end of the 19th century on the initiative of Gustave Revillod, as a tribute to his beloved mother, Ariane, the building was designed to house his vast collection of some 30,000 items, mainly of ceramics and glassware, resulting from his worldwide travels. In addition to the permanent collection, we were able to see during our visit a temporary exhibition running until June, mainly of artefacts from Roman times, the Middle East, India, and the Orient, paying tribute to Revillod’s great legacy.